In this post we shall focus on the main bones located in the arm. They are the Humerus, Radius & Ulna. The previous post on the shoulder elements (Scapula & Clavicle) can be found here. It should be noted that the bones discussed in this post, known as the forelimb, are the homologs to the bones in the leg, the hind limb. 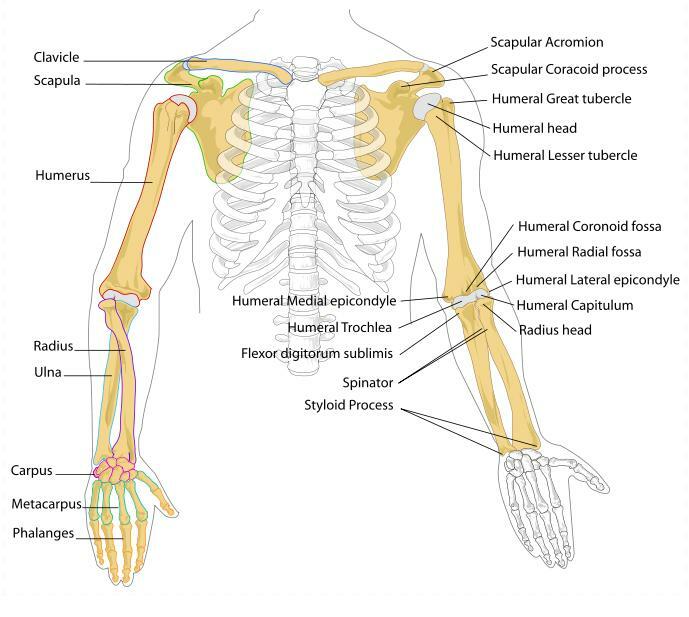 Articulation of arm with the distal humerus and proximal radius and ulna making the elbow joint (Image credit: Wikipedia 2011). As noted in previous Skeletal Series posts care should be taken with excavating human remains, and the maxim that ‘context is everything’ should be well noted with detailed plans of the in-situ remains made. It is likely that some damage will have occurred to the smaller ulna and radius as they are more fragile then the larger and denser humerus bone. A record of the condition of the bones should be made, alongside what contextual information is available (Mays 1999, White & Folkens 2005). The humerus articulates proximally with the scapula and clavicle, as discussed in the last entry (See diagram below). The distal humerus articulates with the proximal radius and ulna head. This articulation makes up the elbow, which will be discussed in detail below. At the distal end of the radius and ulna the carpals are located, which make up the wrist. These, alongside the other elements in the hand, will be discussed in the next Skeletal Series post. The individual brachium and antebrachium skeletal elements and major skeletal landmarks, as seen in articulation with the full limb (image credit: Wikipedia 2011). The function of the forelimb is to provide a rigid limb to help hold, grab and move surfaces and objects. The shoulder girdle and arm bones have moved away from our evolutionary history of weight-bearing limbs, and have become essential in helping humans to manipulate and move objects with astounding dexterity (Jurmain et al 2011). 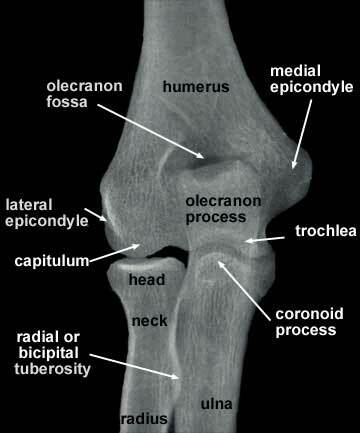 The elbow joint (image credit: CK-12). This joint in particular is important to understand as it is a key hinge joint. The diagram below helps to mark out the distal humerus with the proximal radius and ulna in articulation. The elbow is one of the strongest points of the body in terms of bone hitting strength. The two main movements of the elbow are flexion and extension of the humerus and ulna, alongside the pronation of the radius and ulna in turning the arm over (White & Folkens 2005). The joint itself has a large synovial membrane that protects the articulation points of the bone, whilst the main muscles involved are the Brachialis & Brachiaoradialus (at the anterior side) and the Triceps Brachii & Aconaeus towards the posterior side. The lateral and medial muscles are the Supinator and Extensor muscles, alongside the Flexor muscles and Flexor Carpi Ulnaris muscles (White & Folkens 2005, but also here). Anterior elbow joint in articulation, highlighting the major skeletal landmarks of the three bones that make up the joint. Image credit: here. The humerus is the largest bone in the upper body, and ‘compromises of a proximal end with a round articular head, a shaft, an irregular distal end’ (White & Folkens 2005: 203). It articulates with the Glenoid cavity (or fossa) of the scapula, and as mentioned, the proximal radius and ulna at the distal end. The humerus head faces medially, whilst the surgical (or anatomical) neck is the groove that encircles the head for the attachment of the joint capsule (White & Folkens: 203-4). Both the Greater and Lesser Tubercle are muscle attachment eminences that help move and rotate the upper arm. On the Greater tubercle (the more posterior and large of the tubercles) rugosities for the insertion of the rotator cuff muscles are round, which help in rotation and adduction and abduction of the arm (White & Folkens 2005). Main skeletal landmarks of the humerus (click to enlarge). Image credit: Google 2011. The Shaft of the humerus is variably triangular in section, going from more cylindrical at its proximal end to more triangular in shape towards the distal end (Larsen 1997). The Deltoid tuberosity is an important feature located on the lateral side of the shaft. It is the insertion site of the deltoideus muscle, and is recognised by its roughened appearance. Towards the distal end of the humerus we have several key features that are easily identifiable in recognising this as an upper limb element. The Olecrannon Fossa is the largest of three hollows located posteriorly at the distal end, and accommodates the olecrannon process of the ulna during forearm extension. The Capitulum is the rounded eminence that forms the lateral portion of the distal humeral surface, and it articulates with the head of the radius (White & Folkens 2005: 211). The Lateral and Medial Epicondyle are the non articulating projections of bone, the medial is more prominent than the lateral epicondyle. The humerus is relatively easy to recognise by the certain features picked out above, but parts can be confused with the tibia and femur. With the femur, the head has a distinct depression called the Fovea Capitis whilst the humerus lacks this feature (Mays 1999). The humeral shaft is smaller and less triangular than the tibial shaft. When siding remember that the olecrannon fossa is posterior and the medial epicondyle is larger, and the humeral head faces medially. The deltoid tuberosity is found laterally (White & Folkens 2005: 214). The Ulna is the longest and thinnest bone of the forearm, and articulates proximally with trochlea of the humerus and head of the radius. Distally, it articulates with the ulnar notch of the radius and an articular disk that separates it from the carpals. The Olecrannon of the ulna is located on the most proximal part of the ulna; it is the insertion point for triceps brachii muscle. The Trochlea Notch articulates with the trochlea articular surface of the humerus. The Coronoid Process is the ‘anterior beak shaped projection at the base of the semilunar notch’ (White & Fokens 2005: 219). The Radial Notch is the small articular surface for the radius, and is located along the lateral side of the coronoid process. The Radial Articulation (Ulna Head) is the distal, lateral round articulation that conforms to the ulna notch on the radius. 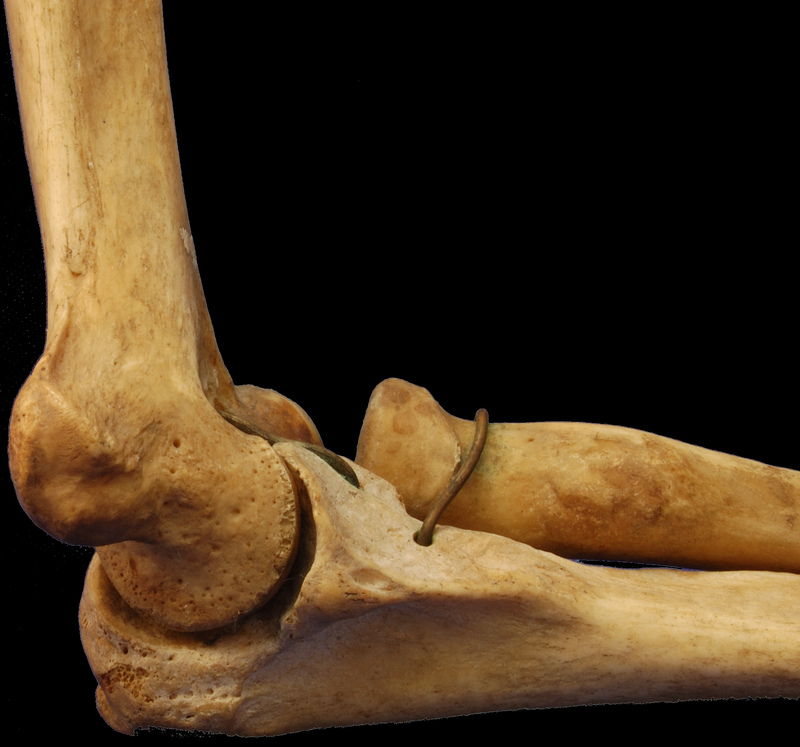 The distal and proximal ends of the ulna are fairly distinctive and indicative of the element, however as White & Folkens (2005) and May (1999) point out, the shafts could be mistaken for radial or fibular shafts. The ulna and the radius and their associated skeletal landmarks, click to enlarge. Image credit: Wikipedia 2011. The radius is a relatively small bone and shortest of the three in the forelimb. Its name was gained for the action it goes through as the ‘turning movement about the capitulum of the humerus’ (White & Folkens 2005: 214). At the proximal end it articulates with the humerus and medially with the ulna on both proximal and distal ends, whilst also distally it articulates with two carpal bones of the wrist. The Head is a round articular structure at the proximal end of the radius, and as stated above articulates with both the humerus and ulna. The Neck is a slender segment between the head and the radial tuberosity. The Radial Tuberosity is a blunt rugged structure on the anteromedial site of the proximal radius that marks the insertion for the biceps brachii muscle (Mays 1999). The Styloid Process is a sharp projection located on the lateral side of the distal radius whilst the Ulnar Notch is a concave articular hollow on the medial corner of the distal radius. Colle’s fracture is a break at the distal end of the radius and ulna that results in a ‘dinner fork deformity‘ with dorsal angulation, and displacement of the fracture with radial angulation. The counterpart to this is Smith’s fracture which is the same but the fracture is displaced in the opposite direction, ie palmar (Marsland & Kapoor 2008: 96). Smiths fracture highlighting the displacement of the distal radius. Image credit: Wikipedia 2011. These type of fractures often occur because of trips or falls onto outstretched hands, as an automatic safety device by the body. In modern contexts they also happen in a variety of sport environments. These types of breaks are often easy to treat with splints and plaster casts, although they sometimes require surgery to correct the breaks and/or angles. The patients can often be left with a visible deformity, but likely without any pain whatsoever (Marsland & Kapoor 2008: 96). In archaeological examples these type of fractures can be found in any number of contexts or cultures. It is important to note that, as Larsen (1997) says, many human cultures’ skeletal series often exhibit these breaks, and it can shed light into pathways of differing lifestyles. Larsen also notes that whilst there is a large osteological literature on injuries in comparison to more population based studies which would help to highlight inferences on accidents and conflict in both historic and prehistoric societies (1997: 109). A detailed diagram of the upper arm muscles can be found here and of the lower arm here. A helpful page for muscle names and motions can be found here. Further information on Colles’ Fractures can be found here.